After the motorcycle safety foundation, your training should never end! Check out my list of intermediate/advanced riding classes to get even better at riding on or offroad. This list will be a work in progress to include training courses that you should consider for after your basic training class. Currently, my list focuses on US based courses only for Road/Track and OffRoad/Adventure. They also focus on classes that offer extensive training after you've ridden at least a few thousand miles on your own. This A-Z list covers road courses including advanced street riding, traditional track days as well as advanced riding skills on the track. Although some of these schools may be based in certain parts of the country, some of them travel around to different tracks so make sure you look at each website. Please send me an email if you have any comments/feedback! BikeSafe Various Locations in North Carolina, "BikeSafe NC invites motorcyclists to participate in Rider Skills Days that offer assessment on present skills and advice from motor officers to help make riding in North Carolina safer and more enjoyable." California Superbike School, Los Angeles CA - Please read my first blog post of my experience at CSS! And then read my second one. "Our job is to improve your riding skills through quality instruction. Your personal goals as a rider will be the focus. - Keith Code, Founder of CSS"
CLASS, Santa Paula CA - "CLASS is about being a better rider. So if you’re a street rider, a sport rider or even an aspiring racer looking to get better, you’ve come to the right place. CLASS is about being a better rider. So if you’re a street rider, a sport rider or even an aspiring racer looking to get better, you’ve come to the right place. Our schools are not just open track time, and we're not simply a "race" school. If that's all you're looking for, this may not be the place for you." Cornerspeed, Charlotte NC - "The Cornerspeed Level 1 Riderschool is a one day comprehensive school. Our emphasis is on bike control through turns and how to develop rhythm as a "pilot" (the correct term for a motorcycle rider/racer). We break down the parts and pieces of what it takes to "be smooth" (rhythm). We do not just tell you to "go out and be smooth", we EXPLAIN AND SHOW YOU HOW to be smooth. " They also offer a Pro Rider Workshop for race level training. Idaho STAR - Boise, ID - "STAR provides training for all levels of riders, taught by Idaho certified Instructors. Whether you have ridden thousands of miles, or have never even sat on a motorcycle, Idaho STAR has a course to fit your needs. STAR courses take place in a controlled, off-street environment and are designed to help you develop the physical skills as well as the mental strategies needed to successfully navigate today’s roadways." MotoMark 1, Burlington NC - "MotoMark1 is the only motorcycle school in North Carolina that utilizes instructor-to-student communication and digital video-enhanced critiques for getting the most out of their students. The biggest difference between our school and others is we do not teach you how to ride…we teach you how to drive your motorcycle. Hence our slogan "Making ordinary riders into…extraordinary drivers." Riding In the Zone, New England Area - "Riding in the Zone is an advanced rider training school, offering on-street, dual-sport training tours and advanced parking lot courses". Ride Like A Pro, Tampa Bay,FL - "My Ride Like a Pro Class is focused on teaching the average rider the three Motor Officer techniques the cops have been trained in for more than 60 years. This course is based on low speed motorcycle handling techniques." STAR Motorcycle School, Buena Park CA - "STAR School is about how to become a better, safer, more proficient rider." Streetmasters Riding Workshops, Rosamond CA - "The Streetmasters Precision Cornering Motorcycle Workshop is a one day workshop designed specifically for touring, sport-touring, cruiser, and sport bike riders. Personalized motorcycle training to take your skills to the next level. You'll be smoother, more confident, relaxed — ready to take on the curves and have fun doing it." Superbike Coach, Bay Area CA - "We offer programs for street as well as track riders of all levels and motorcycle categories. We are teaching MotoGP riding techniques to street riders." 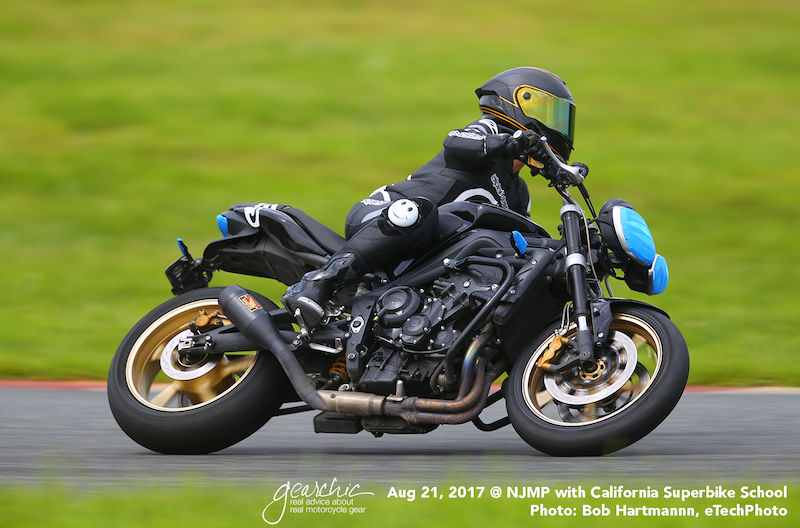 Total Control Training, Victorville, CA - Lee Parks aims to "fill the gap between the Motorcycle Safety Foundation's Basic RiderCourse2 (BRC2) and the many racetrack schools around the country." Utah SBA Advanced Rider Training, Tooele UT - Powered by YCRS. "UtahSBA excited to partner with the Yamaha Champions Riding School (YCRS) to develop an ART curriculum that’s based on the proven success of the YCRS program." Yamaha Champions Riding School, Millville NJ and Wilcox, AZ - "YCRS’s training curriculum is based on Champion’s Habits. The techniques and skills that the best riders in the world use to either go faster, stay safer, or both! If nine of the top ten riders are all doing a similar technique, wouldn’t you agree that there is a good chance it’s the right way to do it? " YCRS offers a Street School called "Champ Street" that focuses on street riding skills along with their traditional track day instruction. Zalusky Advanced Riding School, Brainerd MN, and Elkhart Lake WI. "ZARS is an opportunity for advanced riders to improve their skills, become more proficient, confident riders. ZARS will provide instruction and training geared towards advanced riding while learning critical skills necessary to minimize the risk involved. All bike types are welcome from sport touring, cruisers to sportbike and everything in between! -ridezars.com"
ADVWoman.com, Granby CO - Pat Jacques has a few different training opportunities that include the Annual ADVWoman Rally, offroad tours, and a newly announced Zero to Hero Program that "... will include virtual classroom motorcycle training and preparation for the Motorcycle Safety Federation Basic Rider Course (MSFBRC), purchasing discounts and hands on assistance at regional motorcycle and accessories dealers, a month of beginner appropriate fun rides culminating with an overnight trip." Contact Pat through her website for more details about her programs. BMW OffRoad Academy, CA and CO - "Our primary goal is to show you how to ride your BMW GS comfortably and safely in an off road environment. " BMW US Rider Academy, Spartanburg NC - "Get a little mud on your screen as you join our Chief Riding Instructor for a ride through the BMW U.S. Rider Academy off-road course. If this gets your heart rate up, imagine what two full days of riding can do." Cornerspin, Charlotte NC - "This school is for all types of riders with the emphasis on how these skills learned on dirt apply to bike control on asphalt (race bike, sport bike, cruiser, motard, dual-sport)." Pine Barrens Adventure School, Hammonton NJ - "The Pine Barrens Adventure Camp Riding School will help prepare you to safely navigate your way through this amazing but sometimes challenging landscape, and help improve your off-road riding abilities." RawHyde Adventures, Southern CA "RawHyde Adventures is an off-road training and tour company dedicated to “Big” Adventure-Touring motorcycles. Located in Southern California, we are the “official” BMW off-road training facility in the western United States." Rich Lafferty Racing, Port Elizabeth NJ - "Over the years I have developed some great practice drills to help improve each fundamental skill of off-road riding, whether it be clutch control, brake control, logs, turns, tight trail, whoops or wheelies." Rich Oliver Mystery School, Auberry CA - "The Mystery School curriculum specializes in motorcycle riding safety and skill building, using small low powered motorcycles for ease of training"
She'z Moto Camp, Petaluma CA - "We build confidence, independence, and teach females that they can do anything the guys can do. She'z Moto Camps are lead by Professional Roadracer Shelina Moreda." Tom Asher Adventure Riding Academy, Somewhere in VA - "TARRA is a motorcycle adventure riding school that uses real world techniques for real adventures. Location based on the interest of the ADV community." I know this list isn't complete, it's still a work in progress!